As many of you know, I’m quite obsessed with keeping organized. I love things all neat and tidy, not just for prettiness’ sake, but also for efficiency and general ease of life. I’m showing you today how I keep my most frequently used kitchen essentials close at hand near my stove top. I’m using two silver containers from Bed, Bath and Beyond to hold my kitchen tools- wooden spoons and whisks in one and spatulas and tongs in the other. I find myself reaching for these tools all the time when I’m cooking so I don’t like to keep them buried away in the drawer. Salt and pepper is also close at hand as is the olive oil and spoon holder. I like the bigger salt containers for when I need a “pinch” or a wide mouth to dip a measuring spoon in. The cute salt and pepper labels were graciously given to me by House of Smiths and you can order them here. 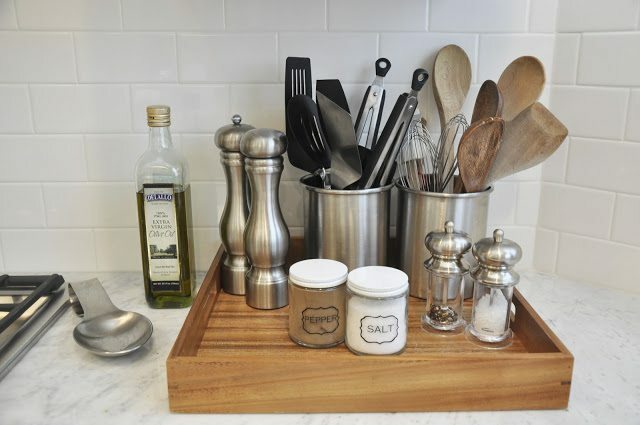 The simple wooden tray from Container Store keeps things looking neat and clean. Hope this gives you a quick little organization fix to kick off your weekend! How happy are you for the weekend?! My honey and I are planning to spend some alone adult time together and I couldn’t be more excited- it’s been a long time!! What are y’all up to?? I love the idea of having a tray on the counter to use as a central space to hold everything…my counter just isn't big enough 🙁 Someday! Love the tray! Great idea to keep everything nicely organized. I have been scouting the House of Smiths too and want some of those great labels! Good idea with the tray, M. Are you going to do the organization series this winter like you did last year? Love this! I love how everything is all in once place, and I love the Bamboo tray! Love how you organized everything! Very functional! Have fun spending time with your hubby this weekend! I have mine set up in a similar way, only I have a lazy susan instead of a tray. Love the idea of having a set of wide mouth jars for salt and pepper too! Might have to add those. as for us, we're headed to knoxville to cheer on the VOLS as they take on GA!! have a great ADULT weekend!! Beautiful, as always. I like that you have things in one place on a tray and not spread out throughout. And really love those salt and pepper shakers. I love this idea! I just bought all new utensils this week (while on a business trip with my husband for a little alone time too)and this will be much more handy than trying to keep them shoved in a drawer! Thanks for the idea! Nice, I love to keep things organized around the house too. That's a lovely tray for the counter top! Happy Friday. I love the tray to keep it all together! I have the same silver canisters for my utensils but how do you keep yours so shiny? Adorei a organização,seu blog é sempre interessante,gosto muito. CK- the silver S&P were a wedding gift from my brother and SIL so I like to keep them out just because I'm fond of that memory. Either set is brought to the table for dinner, the smaller ones more frequently. And I'm starting to love kitchen stuffs. What you have here are great stuffs to look for, I was really stunned. Many people who thought that the small kitchen cannot be designed with a maximum. In my opinion it does not get the same with my opinion. My opinion that small-sized kitchen could have been made good design. You can try, if you want to design a small kitchen that you have to find creative ideas. For example: Use the concept of a minimalist design, buy kitchen appliances in accordance with the needs of your kitchen, and a maximum of Use kitchen layout. Lovely! Great organization. I just did something similar after a big deep cleaning my kitchen.